Welcome to the Musclemania® World Championships! Celebrating its 25th season, it has become the leader among natural bodybuilding events. With exclusive, international television coverage by ESPN International, TSN RDS Canada, Sky Sport Britain, Star Sport Asia and other worldwide networks, Musclemania® is more recognized than any other natural contest worldwide. And with this popularity, Musclemania® continues to expand throughout the world with regional and international events this year. Musclemania® began in 1991 as bodybuilding’s first and only tour of world class level staged competitions. Early on, Musclemania® took a bold and challenging step forward by declaring that this exciting event would become a natural event. It would soon become America’s most popular natural bodybuilding competition. At the prejudging all contestants will be equally and fairly judged within their division and classes. This will include (1) an initial line-up, (2) mandatory poses and comparisons, (3) selected grouping comparisons and (4) individual posing routines. The process is rigorous and demanding, but with the sole intention of selecting who deserves to be a Musclemania® Champion. Musclemania® is known to be a world class stage event. This reputation is earned, in part, due to state-of-art audio system, provided by Digital Dolby. It is recommended that you take advantage of this available technology by having your music edited and dubbed by an audio technician. Only CD-R disc music will be accepted (do not use CD-RW discs). Music may NOT be provided on cassette. To compete at the Musclemania® Fitness India Event no qualification is required. This event is open to all natural athletes. Whether you have past or present bodybuilding federation affiliations, are an independent athlete or a first timer, we invite you to compete against the best natural bodybuilders, Figure, Bikini and Models from throughout India. The Musclemania® India Championships will provide Indian athletes with the opportunity to compete in the Musclemania® World Championships in Las Vegas in November or the Musclemania® Universe in Miami in June by placing in the top 3 in the respective categories. e.g Bodybuilding, Figure India, Bikini India, Model India. All Indian athletes that wish to compete in the Worlds or Universe events must qualify at the Musclemania® India Championships held on Queensland's Gold Coast. The exceptions are those that have already won either a Musclemania® World Title or Musclemania® Universe title. The qualification is set in place to ensure the finest athletes will represent India at these two prestigious events. Worlds & Universe Qualification criteria: A top 3 placing in any of the respective categories including Bodybuilding, Figure India, Bikini India, Model India. Because Musclemania® Pros are a respected group of the finest natural bodybuilders in the sport, qualification is challenging. Currently, athletes can qualify and earn their professional status only by winning selected events and/or weight classes. Professionals in other natural bodybuilding federations may qualify only by competing in Musclemania® amateur or international events. 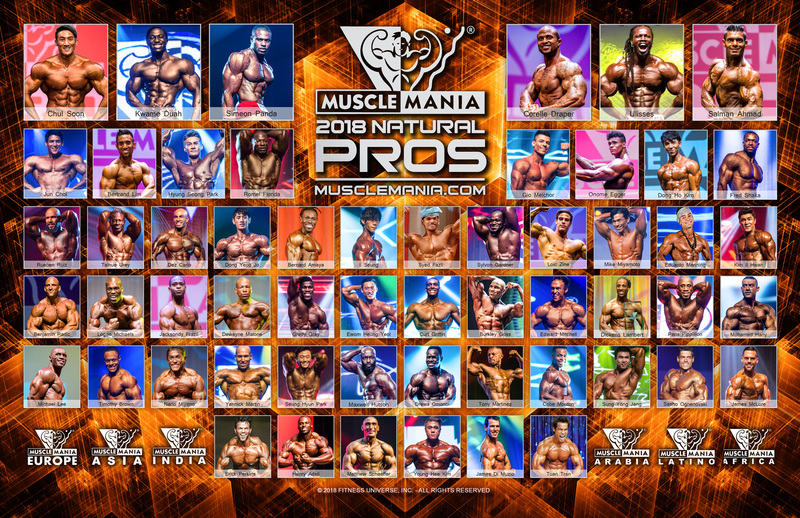 Musclemania Professionals who subsequently compete in other federations will lose their MM Professional status and need to requalify at a Musclemania® regional, national or international competition to regain their status. Musclemania® reserves the right to disqualify or deny entry to any contestant for any reason including, but not limited to, unsportsmanlike conduct, dangerous athletic skills and/or tardiness to any scheduled event or function. Because the Musclemania® Championships are natural bodybuilding events, at least 10 competitors among the Top 5 Finalists must be drug tested by urinalysis immediately following their performance at the Finals. If a contestant is tested positive for any of the listed substances, he/she will be disqualified from the competition, forfeit any prizes and/or rewards and be unable to compete in any Musclemania® event worldwide for at least 2 years. Also, if a contestant refuses to submit to drug testing or attempts to manipulate and/or alter a urinalysis sample, then he/she will be immediately disqualified from the competition.